Welcome to my site of bodybuilding and husky male physique art! I am the creator/writer/artist of the gay comic book and strip Hearts & Iron™, featuring Carl Hanson and John Sullivan, two iron-pumping men who begin a life-journey together. They debuted on Jeff's Muscle Studio and currently appear in 5 self - published issues of Hearts & Iron and a web strip. 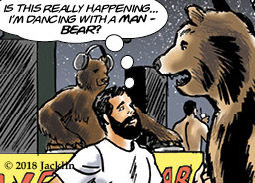 Paul Bunyan, about the adventures of Big Paul and his fellow lumberjacks, and Ursus Major, A Werebear's Tale, about a shape-shifting gay Bear and his Cub, are two other strips I'm currently drawing and writing. To learn more, see previews and online strips, and buy comics, go to the Hearts and Iron website, or the Muscle Studio comics page. To see other (non-muscle art) illustration and design work I do, go to my online portfolio at jeffjacklin.com . Enjoy the site, check out the store and purchase artwork and comics if you'd like. Yes, I do commissions - email me for details and prices. 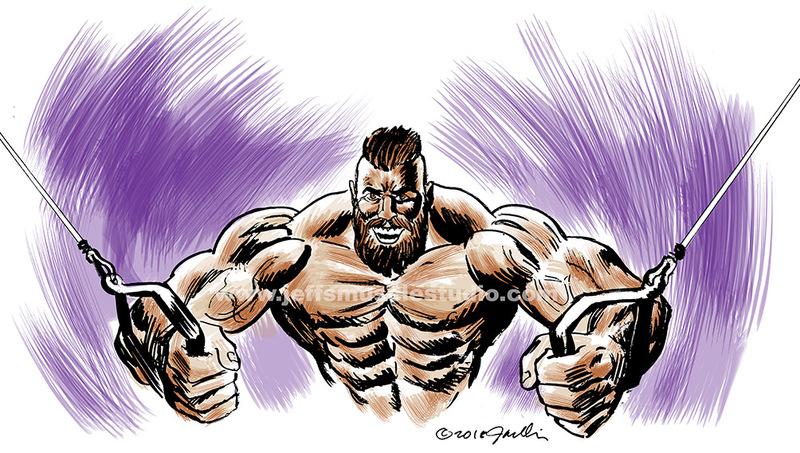 New art on the Muscle Art page, sample below. Go to the page for a larger view. Previews of my webcomics. Click on the links to be redirected to the Hearts & Iron webcomic page, and read the adventures of Carl, John, Big Paul and the Werebear and Cub. Carl and John get ready fior the dance floor. More scenes from Paul's daily life! Below: previews of the Hearts & Iron / Paul Bunyan crossover. I'm back at work continuing these for a collected book. Click on image for a larger view.